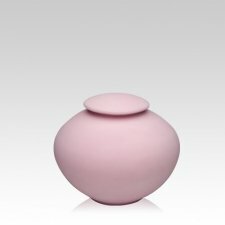 The Rose Pink Porcelain Clay Urn in small is a biodegradable urn made from fine Grolleg porcelain paper clay. Paper clay is a mixture of clay minerals and natural plant fibers. The cellulose fibers help bind the clay together to make the unfired clay urns stronger when dry. Once the urns are place in water or in the earth the plant fibers help soak up water so the urn quickly dissolves. The urns are finished with earth friendly water soluble paints.